This theme park and studio is one of the biggest theme parks in the world and is a favourite recreational spot for kids as well as adults. 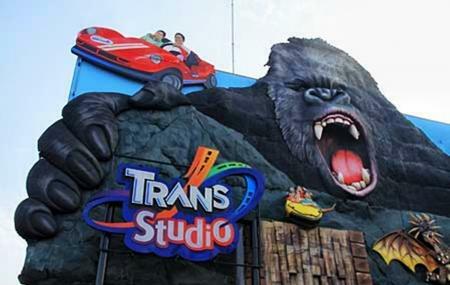 With more than 20 rides and variety of shows, favourite characters and broadways style entertainment, Trans Studio Bandung’s studio central is designed in Hollywood 60' architectural style with the replicas of famous stars like Merlyn Monroe, Michael Jackson, Jeng Kelin among others. The lost city is a great expedition and so is the Magic corner. There are variety of entertainment units and number of restaurants to relax after a tiring ride. Explore the place and have fun on your visit! Also, visit the popular attractions in the city by following Bandung itinerary 1 day. Maps to guide through the studio and theme park are available. The tickets for Saturdays, Sundays and other holidays are 250000 IDR. Additional charges for VIP are 250000 IDR everyday. The ticket for theme park is 10000 IDR. How popular is Trans Studio Bandung? People normally club together St Peter's Cathedral and Cups Coffee & Kitchen while planning their visit to Trans Studio Bandung. People also prefer to end their day with Trans Studio Bandung. I told the girl at the counter that I would write a review - so here it is. She denied my visa card because it was issued by a foreign bank that she was not familiar with. When I asked for her supervisor or manager who might know better, she seemed to have a standard answer - "he is in a meeting". So if the manager is reading this review, the solution will be just a little training and information about what credit card is all about. The place was crowded and a little tired. The underground playground for smaller kids is nice although some rides are not operating. Overall, we enjoyed it and have high probability to come back. Nice place to enjoy your holiday. So many games in this place. Also has many show at trans studio. The ticket is not expensive. Because include all in. Especially if you have mega bank credit card. You can get discount 20%. It is very interesting. It was many people likes to go here. The ticket is at the second floor. There are so many kinds of fun! Note: If there some of them is dirty, don't go here. Please see popular times see how busy that it gets. Maybe about more than millions of people want to go here.